Bwindi Impenetrable national park located in south western Uganda in Uganda’s gorilla trekking destination. The park’s loudest trumpet is blown by the presence of the many of the world’s surviving Mountain Gorillas commonly referred to as the “Bwindi Population”. Bwindi National Park accommodates an estimated 400 mountain gorillas which is roughly half of the world’s gorilla population, the other half being shared among Mgahinga Gorilla National Park in Uganda; and the Virunga National Park and the Volcanoes National Park of Congo DR and Rwanda receptively. Uganda’s gorilla trekking destination of Bwindi therefore boasts of the biggest percentage of the world’s Gorilla percentage presenting her as the foremost desired Gorilla safari destination for gorilla trackers on Uganda Safaris. From the Greek gorillai (meaning hairy women), the gorillas get their name. Extremely gentle animals these are, but their name should never influence an undermining of their strength. A gorilla group or family is headed by power-packed alpha silver-back (the male head of a gorilla family), a name given to him because of the shimmering like hairs on his back. The silver-back enjoys a number of privileges including incessant infatuations from the female gorillas, and the opportunity of having the first taste of all meals, perhaps an explanation of his weight (120kg). However these privileges only camouflage a number of responsibilities that the silver-back must perform including defending his gorilla family from intruders of any kind, even if his life is lost in the fight; pursuing a number of alternatives to bring food to his family; and attracting other productive member to his group. The exact number of total gorilla families in Bwindi Impenetrable Forest is ambiguous but we are sure that currently there exists up to 12 habituated mountain gorilla groups, 11 (eleven) of which can be visited by utmost 1 (one) group of tourists on Uganda gorilla trekking safaris per day for not more than 1 (one) hour. Each group of visitors should and can never exceed 8 tourists. 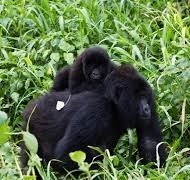 The twelfth group is strictly for research purposes and is therefore not open to Gorilla Trekking Safaris. Below is a summary of Bwindi’s habituated Gorilla groups per sector. It should be noted that some Gorilla families have changed from one sector to anther principally because they are wild animals, capable of unpredictable actions. This is the latest account of their locations, which can change any time in the future.